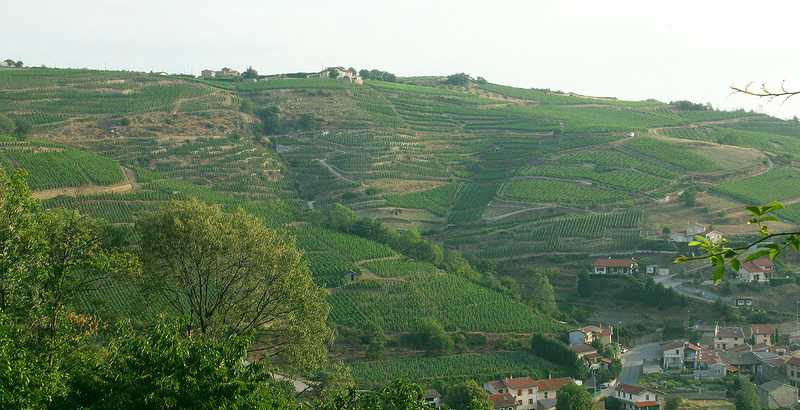 The vineyards of the Condrieu appellation are located in the Rhône Valley, about 40km south of Lyon and 10km south of Vienne. Stretching over about 140 hectares, they straddle three départements and are spread between seven communes: Condrieu in the Rhône département; Vérin, Saint-Michel-sur-Rhône, Chavanay, Malleval and Saint-Pierre-de-Bœuf in Loire; and Limony in Ardèche. The vines grow on the right (i.e. west) bank of the River Rhône, on steep slopes at the foot of the Massif du Pilat. Indeed they are so steep (with a gradient often exceeding 50%), that vines can only be cultivated in terraces. The only authorised grape variety is Viognier Doré.